For any nature enthusiast a trek through Costa Rica’s Corcovado National Park is an absolute must. The 160 square mile park is isolated on the Osa Peninsula and is considered to be the most pristine and bio-diverse rainforest left in Central America. The park is the last stronghold for many endangered mammals, birds and other endemic species. Getting there by land instead of flying was a long and arduous journey from San Jose. Once there I opted to stay at a nearby eco-resort in Puerto Jimenez called the Iguana Lodge. It was a perfect place to relax before venturing into the park. The rainforest’s abundant wildlife stretches out well beyond the official boundaries and I was able to see monkeys and exotic birds without even leaving the resort. After a night of rest I woke early and headed to Corcovado with my guide Fil from Osa Travel. After a rough, bumpy ride on a large truck we were dropped off at the end of a 40 KM long unpaved road; from here on out we were traveling only by foot. Just minutes into the beginning of my day hike we had to cross a small stream and it began raining. We continued along the beach all the way to our camp site just a few hundred meters from the entrance to the park. After a quick break we entered through the La Leona Ranger Station and headed out into the wild, untamed rainforest! Hiking the trail from La Leona takes you along the beach, or in the forest just parallel to it, making it fairly easy to not get lost. Just after entering the park the rainfall dissipated and the sun began shining. It’s amazing just how dark the forest is during the day – the vegetation is so dense that only a fraction of the light makes it to the forest floor. I was still shedding the rain from my body when Fil spotted one of the creatures at the top of my wanting-to-see list; a green and black poison dart frog! Hiking along the trail there were wild animals all around us – many of which payed little attention to our presence. We continued hiking for several hours before stopping to eat a quick snack and rest our feet. As we sat on the beach I noticed some movement nearby and got up to investigate. My curiosity was rewarded with a large anteater crossing a dead log hanging over a stream. It calmly crossed the log just feet away from me! I watched as it nibbled on a coconut and then climbed up a tall palm tree to take a nap. After several more hours of hiking we left the forest trail and ventured back onto the beach which was the final resting place of a decades old shipwreck! The only visible remnants of the wreck were jagged rusty pieces of metal and the ship’s large engines. After some exploration of the wreck’s remains we left to hunt for one of the endemic species of the region – the Golfo Dulce Poison Dart Frog. My eyes scanned the forest floor for the tiny frogs to no avail – littered with dead leaves and debris everything blends into the surroundings. This is where having an experienced and skilled guide becomes very rewarding. Fil spotted several of the frogs right away and I was able to check off another species I had really hoped to see! It was now late afternoon and the sun sets quickly. With the Sirena Station closed our only option was to turn around and head back to La Leona. Along the way we spotted monkeys, a coatimundi feasting on a banana, numerous scarlet macaws flying overhead, and many other wild animals. Before returning to camp we relaxed on the beach and watched one of the most amazing sunsets I’ve ever experienced. We had spent 10 hours hiking and hadn’t seen a single other person in the park the entire day! I couldn’t believe such a beautiful and astonishing stretch of beach could be so private and alone even if it was just for an afternoon. After returning to the station and exiting just across the border of the park we returned to our camp site. Small rustic tents served as a place to rest for the night and eat dinner. We had planned to go out after sunset in search of frogs and snakes but mother nature had different plans. A heavy downpour and lighting storm raged on for hours and we called it a night. Corcovado (and the Osa Peninsula) is a one of kind place that can’t be fully described in words, it’s the kind of place you have experience firsthand before you can truly appreciate just how special it is. I encourage anyone visiting the country to make an effort to experience it. Like many great places, it isn’t all that easy to get to. 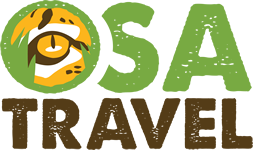 From San Jose your options are a very long bus ride or an expensive flight to one of the cities on the Osa Peninsula. I chose to take the bus to Puerto Jimenez – an 8 hour ride that currently costs 7,505 colones ($14 USD). The bus operator is Transportes Blanco Lobo and departs daily at 8 AM. After arriving in Puerto Jimenez you’re still a long distance from the park’s boundaries. A large colectivo truck picks up locals and tourists every few hours and transports them from the city to the tiny village of Carate. The road from town is unpaved, it’s a bumpy and unpleasant 2-3 hour ride depending on weather conditions. From the drop off point in Carate it’s a 3.5km hike along the beach to the La Leona Ranger Station park entrance. As of 2014 visitors are now required to have a licensed guide before entering the park. Although this makes it less affordable to budget-limited travelers a guide will help keep you safe in this still wild and untamed park. People have gone mysteriously missing inside Corcovado before. Currently the trail to the Sirena Ranger Station from La Leona is closed and only accessible by boat. Wear light, breathable, quick drying clothes – it’s extremely humid and rains frequently. You will be crossing multiple streams that are deeper than most hiking boots can cover, be prepared to take those boots off and get wet.